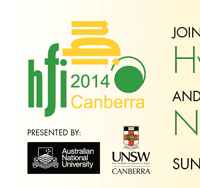 The 5th Joint International Conference on Hyperfine Interactions and Symposium on Nuclear Quadrupole Interactions (HFI/NQI 2014), presented by the University of New South Wales and the Australian National University, will be held at the spiritual home of Australian science, the Shine Dome in Canberra, from 21-26 September 2014. The HFI/NQI conference series provides a forum for the discussion and publication of all aspects of hyperfine interactions, detected by nuclear radiations and of all facets of nuclear quadrupole interactions, detected by resonance methods. This conference scope includes the many and diverse associated applications. The HFI/NQI meetings bring together experts and students from a variety of scientific disciplines including theoretical, nuclear, atomic and condensed matter physics, materials science, synchrotron research, as well as chemistry, biology, medicine and engineering. The HFI/NQI event in Canberra will be the 17th International Conference on Hyperfine Interactions and the 21st International Symposium on Nuclear Quadrupole Interactions.